Grab some popcorn, your iPad, and Epson's new MegaPlex portable projectors and you're ready for a night at the movies. 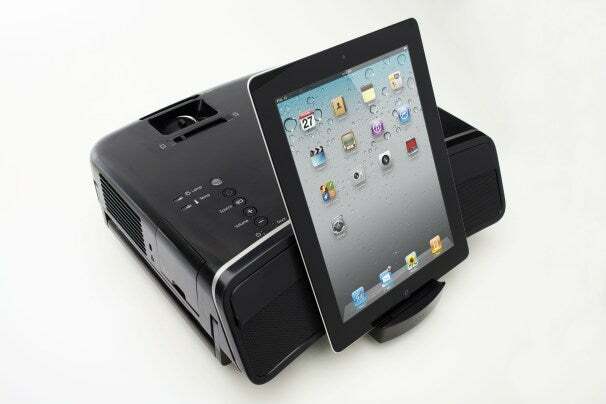 The MegaPlex units have an iPad-, iPhone-, and iPod-compatible dock on the front and can project large, high-resolution videos or still images from the content stored on your iOS unit or from online sources such as YouTube. The MegaPlex units also work with a variety of other devices. The $699 Epson MegaPlex MG-50 (540p video resolution with 2,200 lumens of brightness) and $799 MG-850H (720p, 2,800 lumens) projectors use 3LCD technology and are dock-and-play devices: You insert your iPad, iPhone or iPod into the dock and follow the on-screen prompts from the MegaPlex app. The 8.4-pound portable units come with a folding handles and USB, HDMI and VGA inputs for media streams from other devices, including Microsoft’s Xbox 360, Sony’s PS3, Nintendo’s Wii, PCs, smartphones and DVD players. Also included is a microphone input for narration or karaoke purposes. The MegaPlex projectors can also be used as audio docks by shutting off the projection hardware. Both offer twin 10-watt speakers. The unit will be available later this month at major retailers and at Epson's website. Robert S. Anthony is a New York-based technology journalist. He writes a tech blog called The Paper PC.